Note the line of spectators along the left edge of the range. So… When did this come to an end? It ended when American gun owners in general, and NRA members in particular, stopped caring about such things. Adjusting for inflation, those cash prizes would be over $600,000 today. More than 5,000 spectators schlepped their way from Manhattan on river ferries and a special rail line built to accommodate the shooting range. The candlelit train ride was far from comfortable, the Times reported in a front-page story on Sept. 27, 1874. The fans meanwhile did not necessarily come to support the home team. Irish immigrants brought pride in their native land as well. However, they all came for the premier sporting event of the year. “From what I’ve read and learned about it, it was just about as popular as NASCAR is today,” said Kirk Bryan, co-owner of Shiloh Sharps Rifles, of rifle shooting in the 1870s. Stop building straw men to support your position (even if it’s one I share). There will be more than 6500 shooters this year. How many of the “spectators” you sight were contestants? >> Are you nuts? there are more shooters than ever. No, there are not. There might be more gun owners but there are not more shooters. Note, that was 7,762 registered competitors for the Nationals in 1962 and doesn’t include all the additional “annual participants”, Small Arms Firing School students, and other attendees that also would have been there. Using the same liberties the CMP is now using to arrive at “over 6,000” today, the 1962 count is larger than 7,762. I’m all for the CMP Games and any other organized event that gets people to show up. The vintage guns and equipment adds to the overall event. And the CMP is doing a good job getting people to compete, participate, and attend. If folks won’t shoot National Match Course competition, find something they will try. I’m not building a straw man. Participation rates in organized shooting activity have declined over the years based on the numbers reported by these organizations. “Over 6,000” is less than 7,762. Both are less than 30,000. Also, 9,000 is less than 374,112. “About 95,000” Classified shooters is less than 120,367 in 1961. Math is obviously not your strong suit. Sorry numbers make you sad and confused. Maybe you should be working on critiquing Army participation than Civilian. You know 1962 was the first year of the Civilian Team so natch, there were many trying their luck. The percentage of civilian competitors has certainly increased. They do not get paid to shoot & have all their equipment & ammo supplied for free. I doubt if you have a good perspective from behind that Army mule. There are more arms sales, more ammo sales & more civilians shooting now than ever in our history. There are more NRA instructors, like me, ranges & gun shops than ever. I’ll bet you there are a lot more civilian ARs than military. I’m not a competition man, I don’t think it improves survivability. People want to know how to defend themselves & their families today, they really don’t care about awards or “POINTS”. I was not a detractor of competition until I heard a competition “BIG GUN”, named Rob Leatham commenting on self defense, say about his shooting that “I’m in it for the POINTS!”. Well, I’m in it for survival -training is more important than competition. And Americans are doing that. I’m not criticizing any participants, civilian or military. Just pointing out what the numbers actually are. Civilians have participated at Camp Perry long before 1962. Regardless of team participation, civilians were competing (and sometimes winning) long before. And if Team matches were somehow the deciding factor, civilian teams have remained. >> The percentage of civilian competitors has certainly increased. Again, NO. It has decreased. In 1961 the NRA tracked 120,367 Classified shooters with a membership base of just over 400,000. Today, with a membership base of about 5,000,000 that number is about 95,000. Please explain how lesser numbers indicates an increase of the percentage of civilian competitors? Same was true in the 1960s. More people own guns today, but less of them participate in formal shooting events. >> I’m not a competition man, I don’t think it improves survivability. Once again, history proves you wrong. 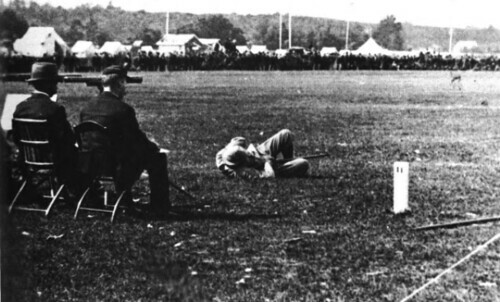 Many of the best gunfighters in history were/are competition shooters. Tom Givens has tracked over 60 student-involved fights and enjoyed a 90% hit rate, and he is a solid practical shooting competitor and teaches competition-compatible technique. >> say about his shooting that “I’m in it for the POINTS!”. And those points are earned by heightened performance of skills common across all uses. It’s the reason why people like Leatham are in-demand coaches for skilled military personnel. It’s the reason why competitive disciplines were created in the first place.